Annoscia, E., 1968. 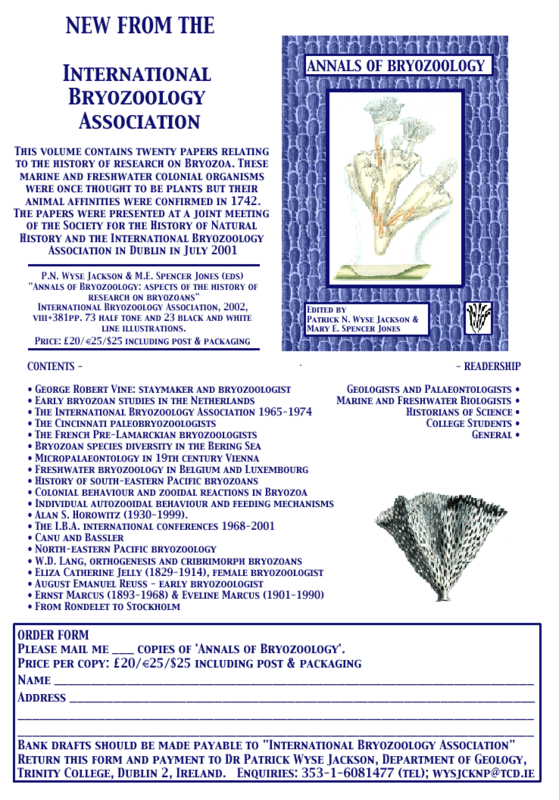 Proceedings of the First International Conference on Bryozoa. Atti della Societa di Scienze Naturalia del Museo Civico di Storia Naturale di Milano. Vol. 108, Milano. Held at Durham, UK, 6-16 September, 1971. Larwood, G.P., 1973. Living and Fossil Bryozoa. Recent Advances in Research. Academic Press, London and New York. Held at Lyon, France, 2-11 September, 1974. Pouyet, S., 1975. Bryozoa 1974. Proceedings of the Third Conference. International Bryozoology Association. Documents des Laboratoires de Geologie de la Faculte des Sciences de Lyon, HS 3 (fasc. 1,2). Universite Claude Bernard, Lyon. Held at Woods Hole, Massachusetts, USA, 7-17 September, 1977. Held at Durham, United Kingdom, 1-6 September, 1980. Larwood, G.P., & Nielsen, C., 1981. Recent and Fossil Bryozoa. Olsen & Olsen, Fredensborg. Held at Wien, Austria, 18-23 July, 1983. Nielsen, C., & Larwood, G.P., 1985. Bryozoa: Ordovician to Recent. Olsen & Olsen, Fredensborg. Held at Bellingham, Washington, USA, 4-9 August, 1986. Ross, J.R.P. 1987. Bryozoa: Present and Past. Western Washington University Press, Bellingham. Held at Paris, France, 17-22 August, 1989. Bigey, F.P., 1991. Bryozoaires Actuels et Fossiles. Bulletin de la Societe Sciences Naturelles de la Ouest de France, Memoire H.S. 1. Nantes. Held at Swansea, Wales, 25 July - 1 August, 1992. Hayward, P.J., Ryland, J.S. & Taylor, P.D., 1994. Biology and Palaeobiology of Bryozoans. Olsen & Olsen, Fredensborg. Held at Wellington, New Zealand, 30 January - 3 February 1995. Gordon, Dennis.P., Smith, Abigail M., & Grant-Mackie, Jack.A., 1996. Bryozoans in Space and Time. NIWA, Wellington. Held at Panamá, 26 - 31 January 1998. Conference Volume: Herrera Cubilla, A. & Jackson, Jeremy B.C., 2000. 11th International Bryozoology Association Conference. Smithsonian Tropical Research Institute, Balboa, R.P..
Held at Dublin, Ireland, July 16-20, 2001. Proceedings Volume: Wyse Jackson, P.N., Buttler, C.J. Spencer-Jones, M., 2002. Bryozoan Studies 2001. A.A. Balkema Publishers, Lisse, Abingdon, Exton, Tokyo. The book 'Annals of Bryozoology' includes the papers from the historical session. Held at Concepción, Chile, January 12-16, 2004. Proceedings Volume: Moyano G., Hugo I., Cancino, Juan M. Wyse Jackson, 2005. Bryozoan Studies 2004. A.A. Balkema Publishers, Leiden, London, New York, Philadelphia, Singapore. To be held at Boone, North Carolina, July 2 -7, 2007.